It's interesting to look back on earlier times when passenger cars occasionally plied WI&M tracks (see photo above, furnished by the late Lee Gale). As we look at more mass transit options in today's world, it's worth recalling that once people routinely rode trains and got to a number of out-of-the-way places. "The Bug" was of course widely used in Potlatch, taking passengers, mail and cargo up to Bovill or over to Palouse. Palouse enjoyed a wide variety of passenger services, and at one point, seven roundtrips per day were offered between Palouse and Spokane. 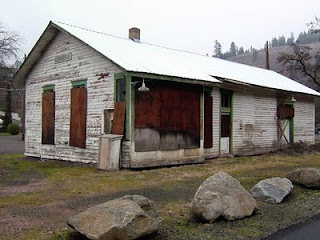 As the WIMHPG continues to restore the historic depot at Potlatch, several locals have mentioned using the building as a real depot again, offering bus service between Potlatch and Moscow/Pullman. With some 80 percent of local residents traveling to the university towns for work, such bus links could make sense--and cents for those tired of piling miles on their cars. The big question: would people use the bus? If you are reading this blog, please post your thoughts on this matter. Brian Dysart logged a comment on the above photo which we have sought to identify in previous posts. He suspects the machine is an old regulator because of the blades on the side. 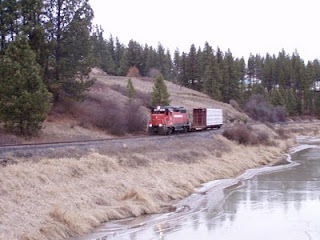 The photo, previously published on the blog in color, was at work on the tracks near Bovill. Thanks Brian for your comment. 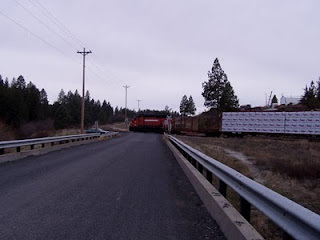 Our historic log car hitchiked into Potlatch behind the W&I locomotive this morning and is now safely located next to the caboose at the depot. We're amassing quite a collection of history for the town. Thanks to the railroad and Jeremy Leiterman for once again helping us, and to Don Somers for the top two photos. The third photo down shows the car being cut loose from the engine. Good thing the brakes worked as it rolled onto the siding. On hand to watch the events was Steve Adlard (pictured with Don Somers), a die-hard railfan from Camas WA who thought he'd hit the mother lode when he saw the engine moving through town. Steve is involved with steam power groups, Timber Times and other historic rail organizations, and has attended speeder days in Potlatch. He's bought land at Santa and plans to retire to the area in the near future. A new HPG member? In a note from Sharon Harris this morning it was announced that the Kendrick depot is slated for demolition on January 12. Sharon and a number of others rallied to save the Kendrick depot, proposing several ideas. Although the mayor didn't support the project, he has indicated that the city would be open to some other project that highlights Kendrick's significant railroad history. This movement has been interesting to watch and the enthusiasm from the group again demonstrates that railroad history is popular. 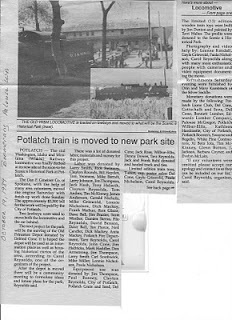 At the same time, the depot had issues that the Potlatch depot did not have, namely that the second story of the building had been removed, altering the original structure. The depot's architecture was similar to other depot architecture and occasionally other depots were altered in much the same way as depot agent living quarters were removed. We hope in the future that the Kendrick rail history fans can find a way to work together to create some sort of lasting tribute to the railroading history in that town. See the group's blog http://savethedepot.blogspot.com/ for more background on this subject. Like the last post, this one includes a photo from Becky Kellom, this time given to her by long-time Latah County resident Bob Denevan, who now lives in Lewiston. 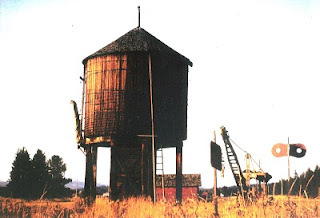 The photo, from around 1955, shows the railroad water tower Potlatch built, drawing water for it by putting a pump and water line into Potlatch Creek. 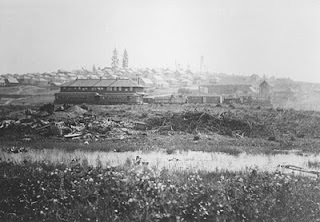 The Potlatch shops are in the distance to the north. Thanks for sharing, Becky. Now that it's been confirmed that Tom Burg's train trip west has been annulled due to poor weather, perhaps the WIM HPG Historian can identify the bottom photo, forwarded to us by Becky Kellom of Bovill. She wasn't clear what the machine was or what it did, so now we leave it to the expert. Tom? While rummaging through some files of more recent Potlatch history, it appears we might have missed an anniversary of sorts. The October 19, 1989 issue of the Boomerang recites details of the moving of Old Number One earlier that week. The historic WI&M locomotive had been a fixture in front of City Hall, but it was decided that the 90-tons of steel would be better placed in the newly-evolving Scenic Six Park. What a day to remember! As dozens of volunteers lined up to do the work, two lowboys waited at the depot. 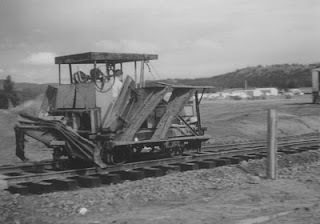 The idea was to lay some track, roll the engine and its tender onto the trailers, then drive them across the flats to the new location. There was a lot of skill, determination and savvy in the crowd that day and watching the action provided plenty of entertainment. Although the mill had closed for good just a few years earlier, it was clear that the community spirit was alive and well. Brains and brawn made the move successful and Old Number One has been a centerpiece at the Scenic Six Park ever since.